Monday, December 18th, 2017 representatives of the University of St. Martin and the Ministry of Education finally arrived at an agreement and signed the MOU securing the continuity of education for students of the USM. This, after the representatives of University of St. Martin had not seen it possible to sign the proposed MOU on December 11th, 2017. However, after hearing an interview by the Minister on the topic on December 12th, the University promptly contacted the Department of Education with a willingness to resume talks, which commenced on Wednesday December 13th. 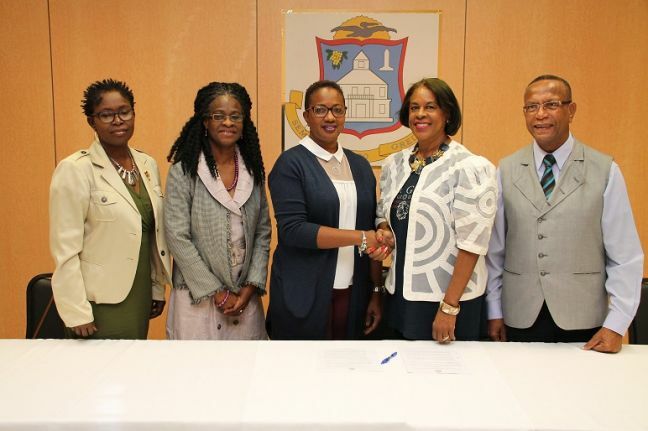 The Ministry of Education, Culture, Youth and Sport was happy to do so and met with the Board of the University of St Maarten Foundation to revisit and discuss the MOU that had been presented to the Board by the Minister of Education, Culture, Youth and Sport. At the end of an almost two hour meeting it was agreed that the University of St Martin would restart the 2017/2018 academic year on January 15th, 2018. Representing the Ministry of Education at the meeting were the Secretary General, drs. Jorien Wuite, the Head of the Department of Education, Mrs. Sidonia Lacorbiniere-Hodge, Senior Policy Officer, Mrs. Ruth Linger and Policy Support Officer, Mrs. Angele Bell. The Board of the USM Foundation was represented by the President Mrs. Valerie Giterson-Pantophlet M.Ed, Vice President Wycliffe Smith M.A., M. Ed., Vice Treasurer drs. Vasco Daal, Secretary Marcellia Henry M. Ed. and MFO Robert Judd. The Ministry and the Board reviewed the various drafts, discussed, negotiated, edited and re-edited a final draft which both parties could live with. It was then agreed that, within 24 hours, the Ministry would send a clean copy of the draft MOU to the Board for review. After receiving the amended MOU, parties continued to negotiate changes over the weekend on Friday December 15, 2017 and Saturday December 16, 2017. Discussions regarding the draft MOU ended on Monday, December 18, 2017 when the representatives of the USMF board and the representatives of the Ministry of Education met to reach to a final agreement on the text of the MOU with the blessing of the Minister under the mandate she’d received from the Council of Ministers. The final text was approved by both entities and made ready for signing. The USMF will receive the necessary financial injection from government in order to restart the 2017-2018 academic year. Meanwhile, the SOAB (Stichting Overheids Accountant Bureau) has begun a financial and management audit of USM which will eventually lead to an advice to government concerning structural funding for the university. The Ministry of Education, Culture, Youth and Sport has established the ordinance on higher education as a high priority and will strive to have the draft ordinance approved by the Council of Ministers by June 2018 in order to start the legislative procedure to the Council of Advice, and thereafter parliament in the second half of 2018. Parties have also committed to work together in the next few months to address the need for a structural increase in USMF’s subsidy for USMF over the next couple of years. The Board of the USM Foundation is grateful to the Minister of Education, Culture, Youth and Sport and her staff for the work they have done to ensure that USM can reopen in January 2018. The Minister of Education, Culture, Youth and Sport and The Board of University of St. Maarten Foundation are both extremely happy to inform the students that they can continue their education after so much uncertainty as to the future of USM. “This is a happy ending for the students, staff and USM family, and the St. Maarten community. The Board of the USM Foundation and Management is happy with the final version of the MOU. USM is undergoing a renaissance, seeking to re-root itself in a more sustainable manner in St. Maarten. The structural funding is an assurance of the sustainability of this higher education institution. As a Board, we know that only by investing in USM, we can guarantee achieving our mission statement, which is to contribute to having at least an associate degree holder in every household on St. Maarten. In other words, an educated population able to face the challenges and make use of the emerging opportunities in our globalizing world. The Minister of Education, Culture, youth and Sport, Ms. Silveria Jacobs, thanks the Department of Education and all other departments and divisions within the Ministry and Government apparatus for their tireless work and dedication to see this through. Minister Jacobs is extremely proud of the ‘never give up’ attitude and perseverance of all involved to continue the fight for longevity of higher education on St. Maarten, with a focus on the students and staff as well as accountability for public funds. Minister concluded by congratulating the students, teachers, staff and parents of the USM students, saying: “Congratulations to especially the students and staff for standing up for what you believe in and for speaking out and letting your voices be heard and for not ever giving up amidst the storm. Government is committed to live up to its pledge to do all within its purview to ensure continuity, quality and accountability for all past, present and future students for whom the University of St. Martin (USM) has been and is the gateway to a better and brighter future”.